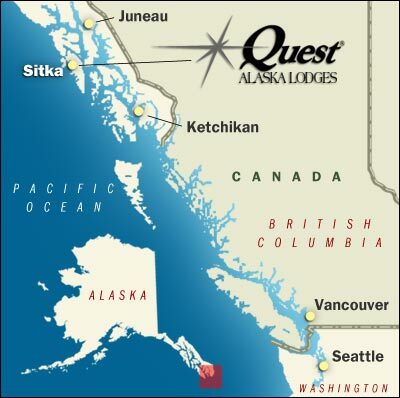 Where is QUEST ALASKA LODGES®? The climate here is mild, with summer daytime high temperatures averaging 61° F in July. Rain is common—it will almost certainly rain sometime during your visit since our area receives approximately 95 inches of precipitation annually. Bring clothing that will allow you to dress in layers, so you can add or subtract layers as the weather and your activities change. QUEST ALASKA LODGES® provides all-weather gear and rubber boots for guest use. Downtown Sitka is filled with a variety of quaint little shops and art galleries, and many major attractions are within easy walking distance. These include the Alaska Raptor Center, St. Michael's Cathedral, Southeast Alaska Indian Cultural Center, the Russian Bishop's House, Starrigavan State Park and many more. To book flights to Sitka contact Alaska Air: 1-800-426-0333.